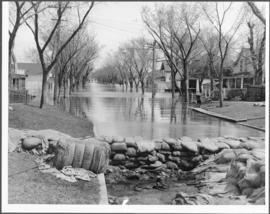 A photograph of floodwaters at the corner of Scotia Street and Cathedral Avenue during the 1950 flood in Winnipeg. A photograph of flooded Notre Dame Avenue East during the 1950 flood in Winnipeg. A photograph of flooded Lombard Street during the 1950 flood in Winnipeg. A photograph of floodwater surrounding the Canada Packers plant during the 1950 flood in Winnipeg. A photograph of a flooded underpass on Anabella Street during the 1950 flood in Winnipeg. A photograph of a long pipe pumping water during the 1950 flood in Winnipeg.